Marisol will be working on her solo piano|electronic music project at Ethnictro from March to April 2019. Marisol's first book, After you, dearest language, is now available as a free digital proof from Ugly Duckling Presse. The digital file is the first edition printed in 2005. The second edition from is still in print. Visit Ugly Duckling Presse for more information. Marisol will be performing songs from her albums, Here Her Ghost and Autoportrait, at South Fest Thailand, an artist residency and festival in Songkhla, Thailand, on Friday, 11 January at 7pm. The music video of Marisol’s song "Hermaphrodite" will be shown in "Marie Losier Shorts Program 1" at The Museum of Modern Art in New York. Friday, November 2 at 7pm and Friday, November 9 at 7:30pm. Marie Losier: Just a Million Dreams runs through November 11. 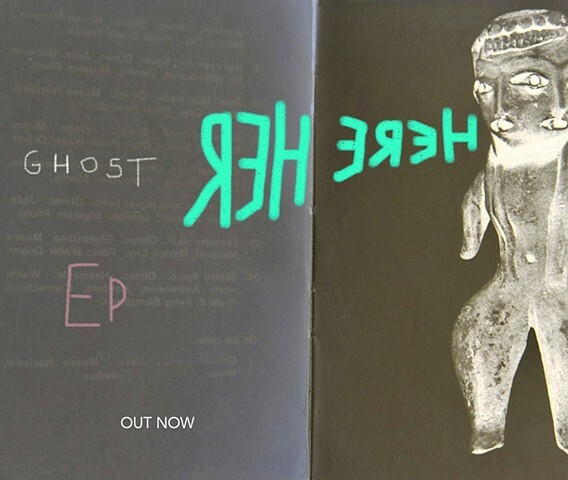 Marisol's new album, HERE HER GHOST was released on 18 May 2018. Listen|Buy|Download here. This digital release is also available on Apple Music + iTunes, iHeartRadio, Deezer, Tidal, and Spotify. PICK UP, co-written by Lena Kovacevic, Godfrey Diamond, and Marisol Limon Martinez, was released by Sony Europe in October. The song was on rotation on MTV at Number 3 in six countries, right behind Lady Gaga. Read an excerpt from Marisol's book Via Dissimulata online at Tagvverk. School of Visual Arts (SVA) presents Critical Information, an interdisciplinary conference examining the contemporary dialogue between art, media, and society. Organized by second-year students in the MFA Art Writing program at SVA, the Critical Information conference provides a critical forum for discussions at the juncture of media, theory, criticism, and the visual arts. Under this year’s theme “Text and Image,” the November 20th conference will present the work of 10 invited participants on three panels: ALTERED PERCEPTIONS with Madeline Schwartzman, Clement Valla and Suzanne Anker; BOOK AS OBJECT with Matvei Yankelevich, Shannon Michael Cane and Andrew Roth; and READING IMAGES with Christian Patterson, Joel Smith, Nicholas Muellner and Marisol Limon Martinez. Marisol Limón Martinez’s Honorary Men . . . comes via Guillotine. It’s a complex work, juxtaposing its author’s own childhood memories with anecdotes about how she is perceived by strangers, by family, by colleagues. Adding another wrinkle to this is her background in music: the teacher who told her, “You play like a man”; the musicians she interacts with on a trip to India. Honorary Men asks big questions, but comes at them in unpredictable ways, venturing into distinctive territory and forming a narrative few others could.
. . . A fascinating, incisive essay by Marisol Limon Martinez, the essay weaves together childhood musical escapes, gender politics, and travel in India for a thoughtful look at identity, and the way our environment gives shape to who we are and who we are perceived to be. Marisol's VIA DISSIMULATA is released by Octopus Books on June 1st. Marisol's nonfiction essay HONORARY MEN is released as a chapbook by Guillotine. Marisol's video "You are Red Just Like Me" is in the group exhibition Creative Mischief at The National Academy Museum, 1083 Fifth Avenue, New York, NY, Opening reception: Friday, May 15th, from 6-9PM, May 16th-24th. Filmmaker Marie Losier has made a music video for Marisol's song Hermaphrodite. Shot on location in Berlin at Lake Wannsee this past summer in 16mm, Marie will be premiering it at the Centre Pompidou in Paris on Sunday, January 19th at 8PM. likewise audio interviews Marisol on her writing and visual art, her book After you, dearest language, recurring images in her work, dream diaries, surrealism, indexes, and networks. In celebration of Julian Talamantez Brolaski's new book ADVICE FOR LOVERS (City Lights), Marisol wrote a song to the poem, "Year of the Misfit" that she will perform live (vocals and piano) at the Branded Saloon in Prospect Heights, 603 Vanderbilt Avenue, Brooklyn on Saturday, December 8th. Ugly Duckling Presse presents a special off-site installment in their Cellar Series which will be held at RH Gallery in New York City on Wednesday, 22 August 2012 at 6pm. James Hoff and Marisol Limon Martinez will be reading from their UDP books, and UDP will be recording for the podcast series. The reading will be followed by an informal conversation with the authors. The reading coincides with a show of UDP rare broadsides and prints at RH Gallery. It has been extended until 6 September. RH Gallery is located at 127 Duane Street in Tribeca between Duane and Church streets. Nearby subway stops: The 1 train to the Franklin station, or the 1, 2, 3, A, C trains to the Chambers stop. Marisol's artist's book Forgotten Knowledge is included in the group exhibition "Hand Voice & Vision: Artist's Books From the Women's Studio Workshop", curated by Kathleen Walkup. January-March 2012. On Saturday, November 5th, 2011, Smoke & Flowers will be playing the grand opening of La Sala Cultural Space in Williamsburg (the former Monkey town) with three-wall projection & surround sound. The shows include original films created at a residency in Marfa, Texas...with Justin Veloso on drums. 10PM. Talibam will perform at 11pm. Note that the November 5th Show is RSVP only with free admission. Smoke & Flowers will be doing an extra special hour-long electronic set at Legion Bar Friday night, the 24th at 10PM. CAMEO, 93 N 6th Williamsburg, Brooklyn. The second printing of After you, dearest language is now available through Ugly Duckling Presse. Official release date: June 1, 2010. Join Ugly Duckling Presse at a reception for 3 new Artist Books by Ellie Ga, Ben Luzzatto, and Marisol Limon Martinez.